Element 2 offers affordable control for smaller venues that require primarily conventional control, some motorized accessories, LEDs and a few moving lights. 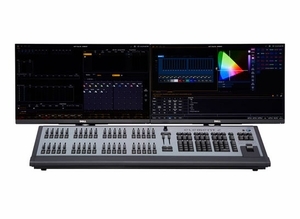 The desk is available in two output capacities, either 1,024 or 6,144 and offers physical LTP channel faders and page able playbacks that change mode with the turn of a switch. A master playback pair and 40 45mm pageable faders are provided. More complex devices are controlled using virtual moving light controls. Element 2 has the same physical keyboard layout as Ion Xe. To get users up and running quickly, Element 2 provides optional command prompts on screen above the command line. Four DMX/RDM ports are available at the console, or all outputs may be distributed via Gateways.